Clear a flat surface and carefully pour a layer of soda crystals into your tray, box or onto your board or cloth. Prepare your glue and brush, ready to decorate your first frosty jar by painting it entirely with the PVA glue. Next, roll the jar in the soda crystals, as per the following photo. Tap it gently a few times once it is completely covered, just to dislodge any loose salt crystals. Next, tie or wrap a piece of ribbon, tin foil, string or similar around the neck of the jar, making sure it doesn't overlap the top and create a fire hazard. Congratulations! You are finished your first frosty lantern! Once the glue has fully dried, carefully sit the jar somewhere safe and light a candle inside it. Now for your frosty snowman lantern. Glue on 2 eyes, a nose and a smile. 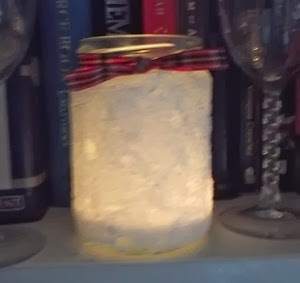 I have used a slither of leftover felt as a scarf, but you could use anything that you have available, as long as it won't melt when you light a candle inside the jar. For the snowman's buttons and smile, I cut small pieces from some junk mail that came through the letterbox - it's always good for something when it's not being used to light the fire. Don't worry if your snowman is looking a little grim and untidy - I made such a mess with the glue that it all popped through the button holes and I had to stick little bits of paper over the top of them! Now it's time to paint the rest of the jar with glue. You don't need to be too particular about this as he is, after all, going to be a frosty snowman. Next, you simply sprinkle the soda crystals all over the snowman or else roll it through the crystals in your tray or box. Finally, once the glue has dried, carefully light your candle and set your frosty snowman lantern some place safe, out of the reach of children or pets. Feel free to experiment and please consider sharing photos of your finished creations on www.frugalforums.co.uk in our Arts, Crafts, Hobbies and Fun Stuff section. This is a lovely idea, I might try it myself.